In 1966 I received a call from my uncle Leo Mahdjoubian. He was an Armenian who had fought with the Black Watch in WW-I and had moved to Argentina after the war. 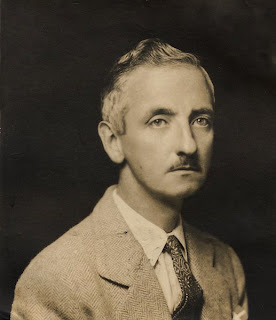 He stayed at a pensión run by my grandmother Ellen Carter and soon was part of the family. Uncle Leo told me, "Your old man George has kicked the bucket. He died on the street and was taken to the Hospital Pirovano by a police sargeant. You have to go to the police station to sign a document." He told me he was sorry and rang off. At the police station the desk sargeant told me that there was some sort of mistake as my father's son had already been there and signed the papers. That's how I found out I had a half brother. I met Enrique the next day. I have no idea to this day how he was able to find my phone number, why it was Uncle Leo who called me in the first place, and how Enrique had learned of George's death. When I met Enrique, who spoke no English, I was struck by his resemblance to my father. He had the same blue eyes. Enrique was about 12 years older than I was. I met a couple of Enrique's sons. His sons looked more like my father than I did. Enrique offered to help pay George's funeral. With my $1.00 US Dollar monthly pay as an Argentine Navy conscript I was going to need need some help. I turned Enrique down. The sargeant, who had taken my father to the hospital, had called me. At a corner boliche (cafe) he placed in my hand a sum of money that subsequently paid for a modest funeral. The sargeant had removed all of my father's posessions from his pocket saying that in the hospital they would have disappeared. He told me he had known my father. My father (above, left) had been working to save up money to bribe a general to get me out of the service so I could go home to Mexico. This was the money he had found in my father's pocket. 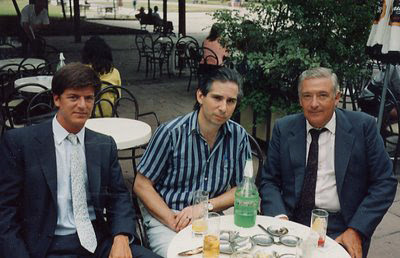 Years later, in 1989, Enrique (right), his son Patricio (left) and I sat for coffee at La Biela. Patricio took out a small stone from his pocket and threw it in my direction. "I went to George's grave at Chacarita Cemetery. He's not there anymore. A Mrs. Gomez is buried there. It seems you didn't pay for perpetuity. Maybe this stone was close to his bones before they threw them away." My mother, who was a beautiful swimmer learned to dance the tango with my father. Enrique's mother told me that she was not aware that my father had ever danced the tango, "George was an excellent swimmer and he taught me how to swim." The Retiro train station in Buenos Aires could be anywhere in London if it weren't for the Argentine Spanish you would hear on the platforms waiting for the train to Coghlan where I lived as a boy. My uncle Freddy Hayward, who was born in Buenos Aires and worked for Glaxo, went back "home" to England every few years. He always wore his St. Andrew's Scots School blazer when I was invited for tea. I liked to go because Aunt Iris made the best deviled ham in the world and both Uncle Freddy and I would smoke our Bewlay pipes (filled with Galloway's Three Nuns) after tea. 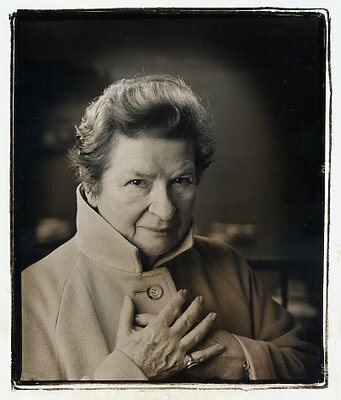 Recently when I went to Buenos Aires in November 2004 with Rosemary and our granddaughter Rebecca I told Rebecca that my first cousin and godmother, Inesita O'Reilly Kuker spoke like the Queen of England. Strictly speaking it is the other way around as Inesita is 83 and so is older. Some years before, her husband Dolfi Kuker (who introduced me to the unique Argentine white wine made from torrontés grapes) took me on a tour of patrician Buenos Aires which included lunch at the venerable Jockey Club. As a young man I had spent weekends in the Paraná River delta called El Tigre. 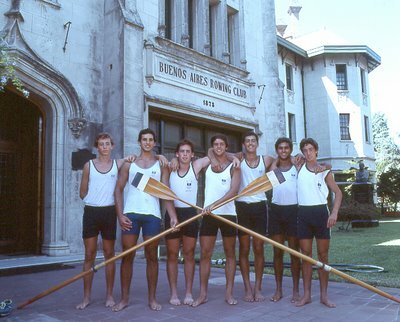 Each ethnic community had its own rowing club and I would lust after the women rowers with my friend John Sullivan (he was a conscript in the Argentine Army while I was in the Argentine Navy) who had a small bungalow on one of the thousands of little islands of the delta. We would identify the red, white and green stripes on the tips of the oars as those from the Italian Rowing Club while the red, black and white were the Germans. But our favourites where the English ladies who rowed with white and blue striped oars of the Buenos Aires Rowing Club. Alas! When Dolfi Kuker took me to their club house all we found were these handsome young men. This is one of those lucky photographs that just happens. 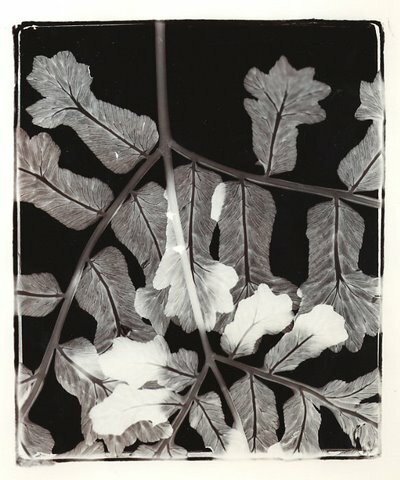 I took it in Veracruz in 1968. It was the "norte" season so the wind was blowing on the seaside promenade called the malecón. I had married Rosemary a year before in Coyoacán, Mexico but I courted her in Veracruz where my mother lived on Pinzón Street. I have a feeling that our first daughter Alexandra Elizabeth may have been conceived in what really is one of the oldest cities of the New World. It somehow feels inevitable that Rosemary and I will return. I often wonder what it would have been like to have been around when the Three Times Heroic City of Veracruz (in one of the three incidents pirate Henry Morgan raped and pillaged it) witnessed the landing of the American army during the Mexican American War. There was a young captain in the US Army who, with his genius, managed to organize things so that Veracruz fell without much bloodshed. The young Captain was Robert E. Lee. When the digital revolution was in its infancy, when everybody seemed to be home publishing and anybody with a Macintosh could and did print their own business cards, the man on the left (Chris Dahl) knew what was coming. Crossing Burrard at Nelson with Chris some years ago, I remember that afternoon vividly. He said, "No matter what happens you and I will always be in demand. They will hire us for our eye. Eyes will never be obsolete." The man on the right, Mac Parry, has lived three periods of his life in BC after he arrived from England around 1969. Of his first I know little. Of his second,I met him in 1977 when he was editor of Vancouver Magazine. We all knew him as Mac. In his present third period as gossip columnist for the Vancouver Sun, he is known as Malcolm. 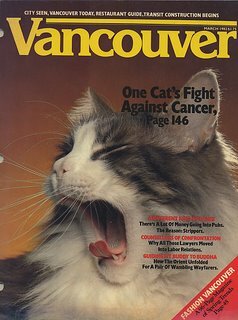 With Chris's art direction and Mac's editing Vancouver Magazine was the best magazine I ever worked for and many thought and still think this. 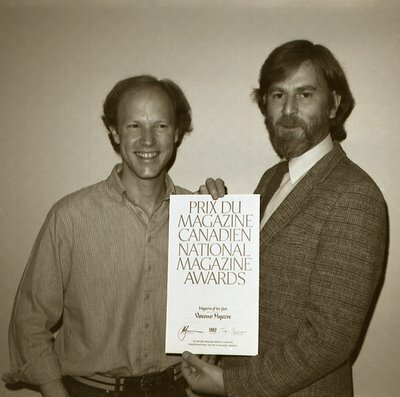 This photo was taken in 1983 when Vancouver Magazine demolished the Toronto Mafia to win the National Magazine Award for the best magazine of the year. I remember one day in early February, 1982 when Mac took me to the Cecil Hotel. He told me, "Sean's (Rossiter) cat has cancer. He's written a story about it. Go home and photograph your cat. Make sure his whiskers are sharp because we're putting him on the cover." For about a week before the magazine went to press I was on a high. I was going to have two covers on the same magazine in the same month. Mac almost convinced publisher Ron Stern to have Gaticuchi (my cat's name) on the cover for half the press run. In a different area of the city my photo of a stripper in tub at the Cecil Hotel, illustrating a story by Les Wiseman was going to be the alternate cover. Francisca Darts was 90 last week. She and her husband Edwin bought a 7.5 acre untilled bush in Surrey, BC in 1943 and turned it into a botanical garden that is the only private garden (after Edwin's death Francisca donated Darts Hill to Surrey as a Concervancy Trust)in BC that can compete with the UBC Botanical Garden and VanDusen in botanical richness. When you visit Darts Hill you will see a botanical diversity that is more astonishing when you realize that most of the huge conifers and broad leaf tress were all planted by Francisca from seed. Through the green coat tails of my wife, who is a member of the BC Alpine Garden Club, I have been able to meet and enjoy the company of Francisca many times. I particularly remember her "show and tell" after the somewhat dry and long BC Alpine Garden Club meetings. 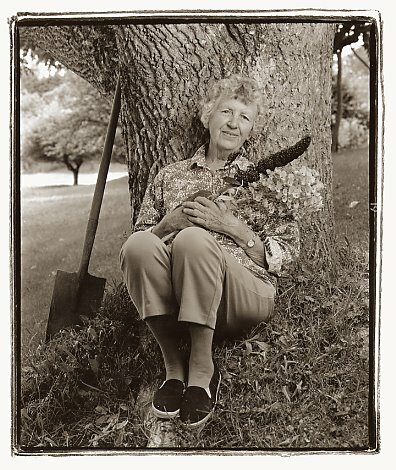 She would enthusiastically bring plants from her garden that had caught her eye that day. It was about 10 years ago that Francisca's hands began to shake and she would spill coffee on herself. She once told me, "Darn when I hold my plants my hands don't shake." It was at her garden many years ago that I first saw my first good specimen of an Osmunda regalis commonly called a Royal Fern. I often tell my granddaughter Rebecca that our plants talk to us and tell us they need more light or more water. When they grow well I almost think they are telling us they are happy. But Francisca is the only gardener I have ever met who talks to her plants. This she told me. I believe her. The proof is in Darts Hill. At 2 p.m. on October 21, 1996, I had an appointment with Baroness James of Holland Park. Phyllis Dorothy James (75) was at the Renaissance Vancouver Hotel Harbourside. I was to address her as Baroness James. I wore a suit. Although I might not have looked at her twice if I had run into her shopping at Harrod's, the plainly but immaculately dressed P.D. James looked at me with the dissecting eyes of a surgeon and, pointing to her window overlooking the harbour, she asked me: "What are those?" 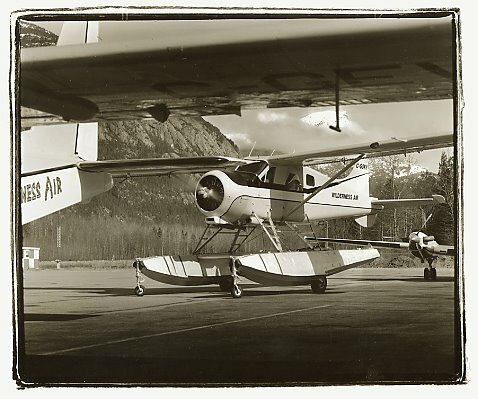 "Those, Baroness James, are de Havilland Beavers, the truly Canadian float planes." She wanted more. 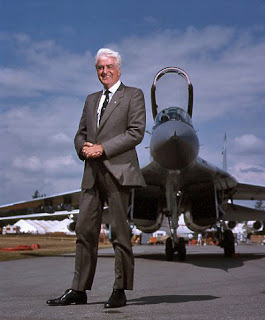 Fortunately I had worked with writer Sean Rossiter, whose the Immortal Beaver: The World's Greatest Bush Plane, had just been published by Douglas & McIntyre. "The curious fact about this book, "I told her, "Is that the author had the idea while drinking beer at a local pub with a quintessential English name, the Marble Arch." Baroness James smiled when I chose to ask her about her science fiction novel The Children of Men instead of her Dalgleish mysteries. Right is an unusual version of the de Havilland Beaver as this one is equipped with wheels to land on land. I took the photo in Campbell River. 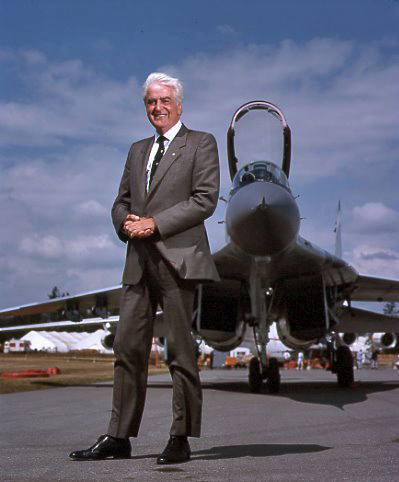 Donegal born Patrick Reid was first in his class from Sandhurst in 1944. As a young tank commander (even though he loved airplanes) in the North Irish Horse in Italy, he played polo on captured German Army horses during the lulls in the heavy fighting. He came to Canada in 1949.